Serenity Dog Retreat is a private luxury dog daycare and overnight boarding business conveniently located south of Atlanta, Georgia. The owner Beth Ramsey had a lifelong dream of creating a boarding facility that was calming, peaceful and had a personal touch like no other. She purchased a beautiful property that sets her apart from other pet boarding companies in the area. Through a referral, Beth came to me for a solution that needed to portray her business as just that: special, beautiful, inviting, and above all a place people could trust to leave their beloved pampered dog. The website had multiple goals to achieve. The website was both an online information gateway for potential visitors as well as setting the first conversation for the expectations of clients. From the different daycare options, overnight lodging, spa services, as well as the how to register your pet. I worked with the external booking pet site, PetEx, to create how-to videos to show how easy it is to register a new client. 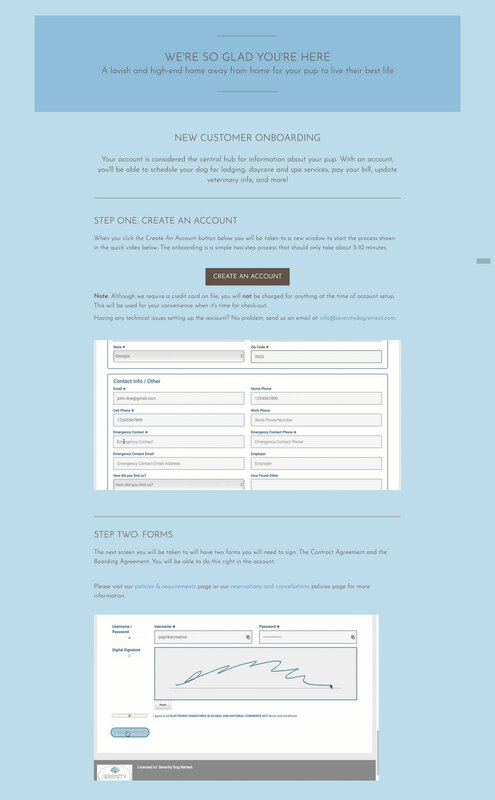 I worked closely with Beth to achieve both her visual goals but also the user flow and content flow for new visitors. Finally, this site had to be easy for Beth to update. I provided her with very detailed instructions on how to update the site pages. We were able to meet her tight deadlines by taking advantage of project management tools such as Trello, Dropbox, Google docs, emails, and how to docs. So if you are lucky enough to live near Newnan, Georgia and have a dog be sure to check out her business. I know my dog, Lily, wished we lived closer!